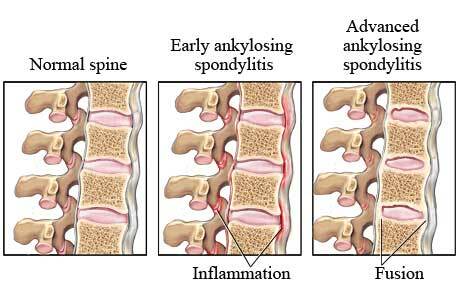 Ankylosing spondylitis is a form of joint inflammation (arthritis) that is long lasting (chronic) and most often affects the lower back. It causes inflammation and damage at the joints, and first affects the sacroiliac joints between the spine and the pelvis. Ankylosing spondylitis also can affect other areas of the spine and other joints, such as the knee. Over time, joints in the spine can fuse together and cause a fixed, bent-forward posture. The word spondylitis refers to inflammation of the spine; ankylosis means fusion or the melding of two bones into one. Ankylosing spondylitis is relatively rare. It affects about 1 in 1,000 people. It may run in families, although its cause is not understood. It most commonly strikes otherwise healthy young men. If you continue to suffer with ankylosing spondylitis and your current treatment plan leaves you feeling hopeless, perhaps a fresh set of experienced eyes can change your outlook. Since 1990, Dennis M. Lox, M.D has applied his personal interests in sports medicine, cutting-edge regenerative medicine and chronic pain management to helping patients increase their quality of life. Contact us for an appointment at 727-462-5582.